The Broward MPO continues to play a leadership role in implementing Complete Streets in Broward. The vision is to create a safe and efficient transportation network that promotes the health and mobility of all residents and visitors by providing high quality multi-modal (pedestrian, bicycle, transit and automobile) access throughout Broward.The Broward MPO endorsed the Complete Streets Guidelines on July 12, 2012 to facilitate and assist local governments in the implementation of Complete Streets. It serves as a template that can be adopted, modified, customized, or expanded based on each community’s needs and desires. Currently, the Technical Advisory Committee (TAC) created a “Model Policy Taskforce” and “Model Plan Taskforce” to develop a Complete Streets model Policy and a model Plan. The model Policy and model Plan will guide local governments in revising internal policies and regulations to help implement Complete Streets. They will also help identify and prioritize Complete Streets corridors, leading to the funding and construction of projects. In addition, two demonstration projects to illustrate principles and measure the benefits of a “Complete Street” have been identified. A “Complete Street” in a suburban area may look different than a “Complete Street" in the urban core, but both are designed with the same principles. Taking this into account, the two demonstration projects selected for analysis are: Hollywood Blvd. – 26 Ave to Dixie Hwy (Urban setting) and Sunset Strip – NW 72 Ave to NW 19 St (Suburban setting). Both corridors accommodate all modes of transportation. It is the intent of the Broward MPO to partner with the municipalities to implement Complete Streets projects. 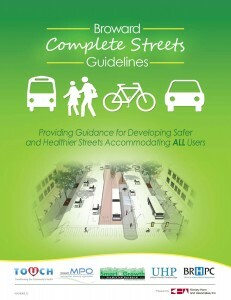 The Broward Complete Streets Guidelines are now complete and available for use. The guidelines were recently approved by the Broward Metropolitan Planning Organization.